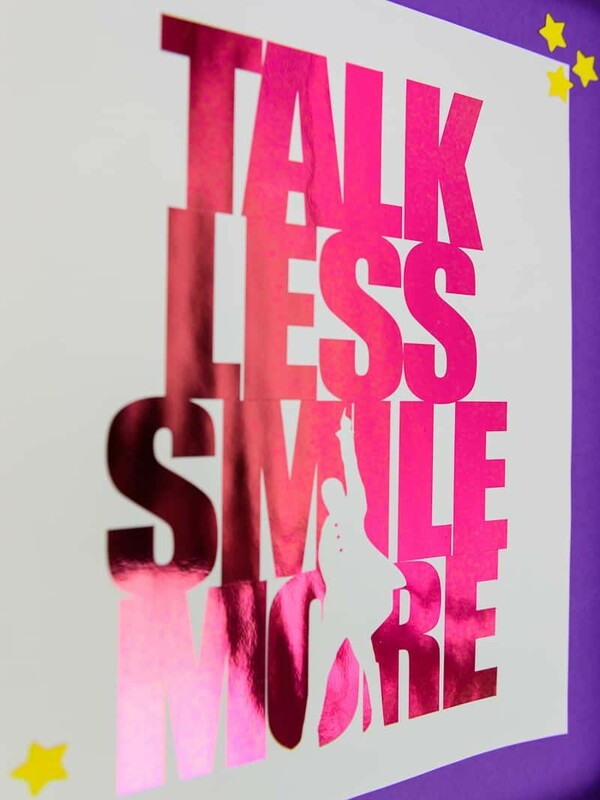 Make this quick and easy Hamilton Print with Deco Foil and your Silhouette Machine! I’m a little late to the game but I am so obsessed with Hamilton. I mean, I’m not a huge fan of rap but this musical is just….ahhhh I love it. I’m also super obsessed with reading about Hamilton, Burr, and Eliza after listening to all the songs. Honestly, my favorite thing about this musical is that it’s gotten me more interested in America’s history. And the fact that there are very few inaccuracies make me love it even more. Who knew that a musical about our Founding Father’s would be this interesting? Seriously though. Who knew? Because I didn’t! 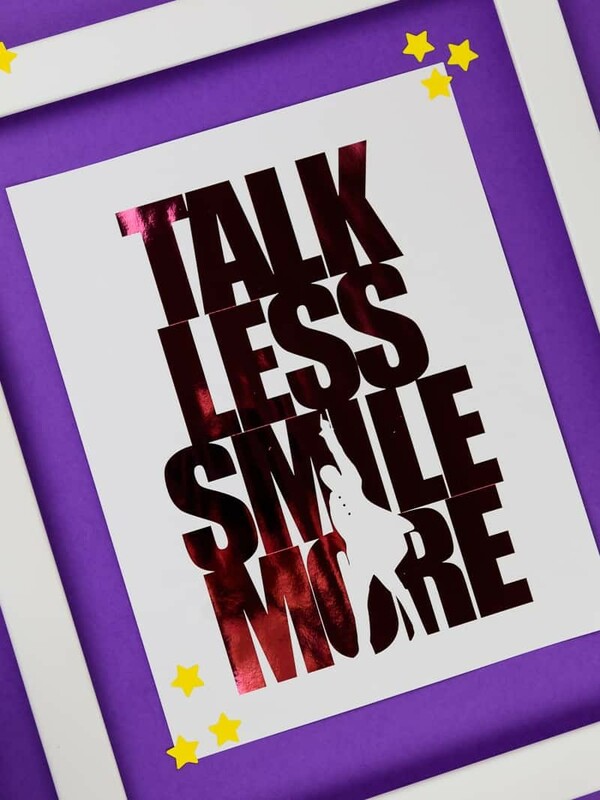 I remember downloading the soundtrack and listening to it for the first time, and the one phrase that stuck with me was…”talk less, smile more”. Burr says it to Hamilton when they first meet and for some reason I really loved that line. Maybe it’s because I have a tendency to overshare and go on and on when I really should just stop talking, but I digress. After working with the deco foil for my Disney shirt I really wanted to know if I could use it on paper. So I tried it out first on some Valentine’s and it worked! And since I really wanted a Hamilton quote somewhere in my gallery office I figured doing it in foil would be ah-mazing! It is. I mean, I’m in love. SO FREAKIN’ EXCITED ABOUT THIS PRINT Y’ALL! 🤗 And depending on the light it kind of looks like it’s on fire! 🔥 So cool you guys. SO COOL! Make this quick and easy Hamilton print with deco foil for your home too. It’s so cool! + Heat up your MINC machine to the 3 setting. + Place your Deco Foil with the color side up on your laser print inside your transfer sheet. + Run the transfer sheet through your MINC machine (don’t push it through or pull it out). 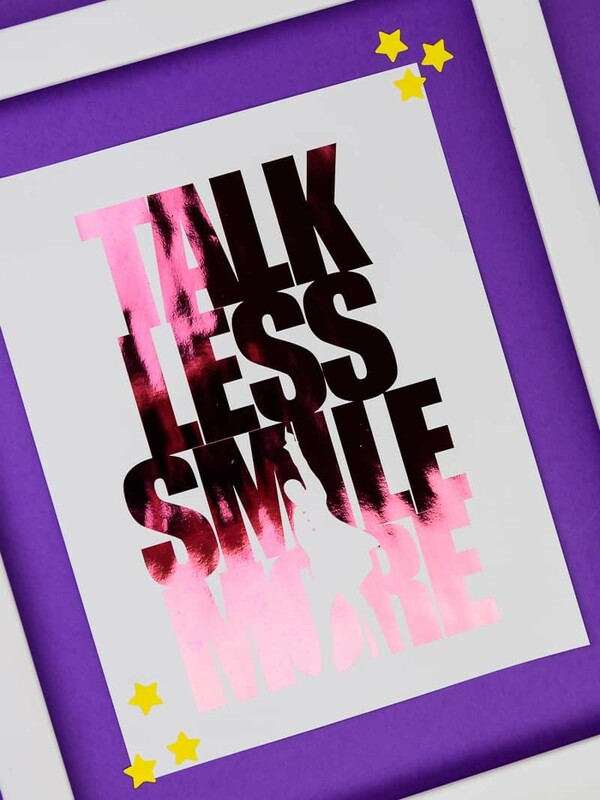 + Remove the foil from your print and you should have your very own DIY deco foil print! This was so easy and I’m really excited with how it turned out! I kind of went crazy and bought a bunch of colors of the deco foil because I love it so much and want to use it on EVERYTHING. The hardest part of this project was trying to figure out what color foil I wanted to use. Projects like these can be quickly knocked out during nap time and those are always my favorite types of crafts. Super simple but they have a ton of impact. I mean, seeing this Hamilton print with deco foil hanging over my computer every time I’m in my office will make me so happy. Now I just need to find more things for my gallery wall! Check out more of my deco foil projects for crafty inspiration! My 21yr old daughter got me into Hamilton and I LOVE IT! My favorite quote is, “There’s a million things I haven’t done…just you wait”. I think that will be what I put up in my crafting office. That should be the quote I put outside the front door. Lol That way people will know why my house is a disaster. Haha! Thank you for sharing such a cool idea, I truly appreciate your kindness. Glad to know that I’m not the only person that is a Hamilton lover. Hugs from Roswell, NM (UFO CAPITAL OF THE WORLD/1947 supposed UFO crash…so they say. Lol). Enjoy your weekend.